PREVIOUS EXPERIENCE: U.S. Army Reserve: field artilery. U.S. Marine Corps: ammunition technician. U.S. Army: second lieutenant (recruiter, later cargo transfer company platoon leader); first lieutenant (assistant battalion operations officer); captain (battalion logistics officer, later assistant division transportation officer, then forward support company commander, then assistant brigade logistics officer). EDUCATION: B.S., interdisciplinary science, South Dakota School of Mines, 2000. Jason Ballard spent four years in the Marines, distributing ammunition in locales as diverse as Somalia and Okinawa. When he left the service, he was tired of logistics. 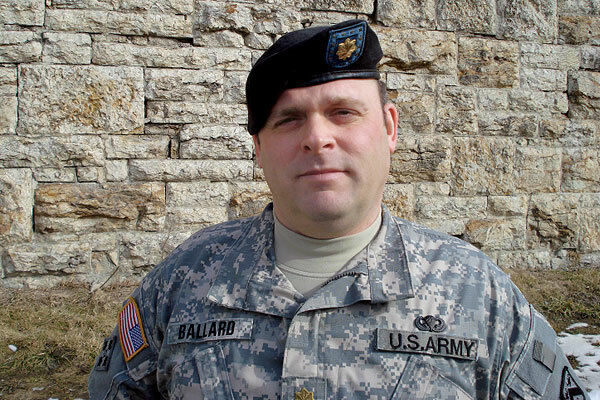 Six years later, when Ballard graduated from college on an Army scholarship, the newly minted second lieutenant found himself back in logistics. "That was a sign," Ballard says. A good sign, it turns out. Fast forward several years, and there's Captain Ballard, assistant division transportation officer, moving soldiers and equipment from Fort Hood, Texas, through Kuwait to fighting positions in Iraq.